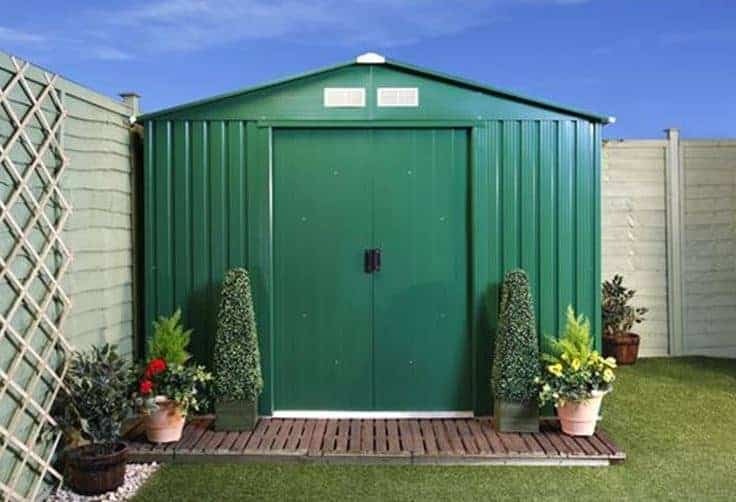 The Billyoh Beeston metal shed with foundation kit is a premium shed that will protect your outdoor and garden items from the elements all year round. Standing at 8x6ft, the interior is spacious enough for the average household to store their tools and accessories. The Billyoh Beeston is a fantastic all-round shed for those requiring all the standard features of a basic shed for storage of their outdoor and garden equipment. Below the team at whatshed.co.uk identify and discuss features and aspects of this particular model to help you make an informed choice during the garden shed buying process. Exterior: Constructed from hot dipped galvanised steel, the Billyoh Beeston provides a tough reinforced exterior which will ensure it is standing in your garden for many years to come. The corrugated wall and roof panels both channel the wind and provide additional strength to the structure. 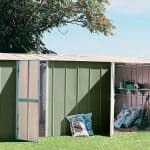 In a dark gardeners green colour this shed will have no problem blending into the background of your garden. Interior: The 8X6ft interior provides a good amount of space for all of your smaller and medium sized garden and outdoor equipment such as tools and smaller garden equipment. Additional storage space can be created to take advantage of the 6ft8 height by adding freestanding shelving. Doors: The sliding double doors are a great space saving feature and with a good width of 106cm across the front of the shed, you will have no problems in accessing those larger or awkwardly shaped items. Security: No security fittings are included as standard with this package however a Billyoh deluxe steel padlock set may be purchased as an optional extra for your peace of mind. Foundation Kit: A foundation kit is recommended by Billyoh to provide a solid base on which to place your metal shed. Different options may be selected depending on your requirements. 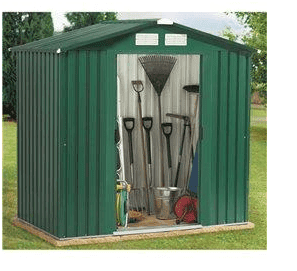 The Billyoh Beeston 8 x 6 Metal Shed With Foundation Kit: How easy to build? The Billyoh Beeston will be delivered directly to your door in a flat-packed package. All the panels, roofing, fixtures and fittings will be provided; all that will be required is a basic set of tools for assembly. A full set of instructions will be provided with a detailed step by step guide and easy to follow diagrams. It is recommended by us and by the manufacturer that a team of two people work on assembly of this shed together, not only for safety reasons but also for efficiency. We expect that this shed could be assembled within a day. 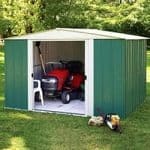 The Billyoh Beeston 8 x 6 Metal Shed With Foundation Kit: What is the overall quality like? The Biilyoh Beeston is designed to be a premium standard shed with all the features that you would expect from a top quality metal shed. With a hot dipped galvanised steel exterior with corrugated panels that channel the wind, your shed is built for a long life in your garden. Fire resistant, weather resistant and rustproof you will be given peace of mind knowing that season to season the Billyoh Beeston will protect your items, keeping them dry and secure. 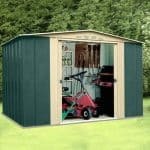 Maintenance free, this shed would be a fantastic option for the busy family or individual that wants a great looking shed with none of the hassle. 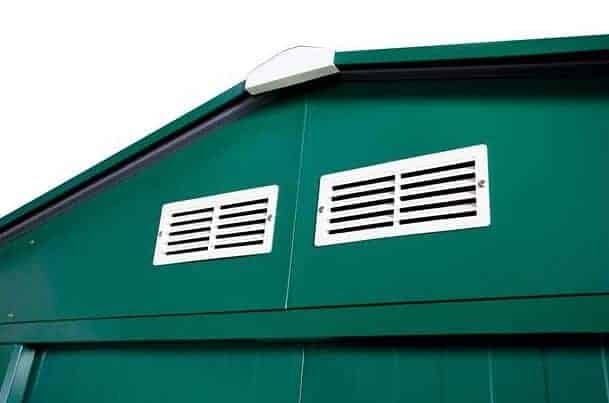 Keeping your sheds smart appearance is easy – if your shed becomes dirty at any time simply hose down with water. Billyoh recommend the use of a foundation kit to provide a stable and solid foundation for your shed – a range of options are available to purchase. 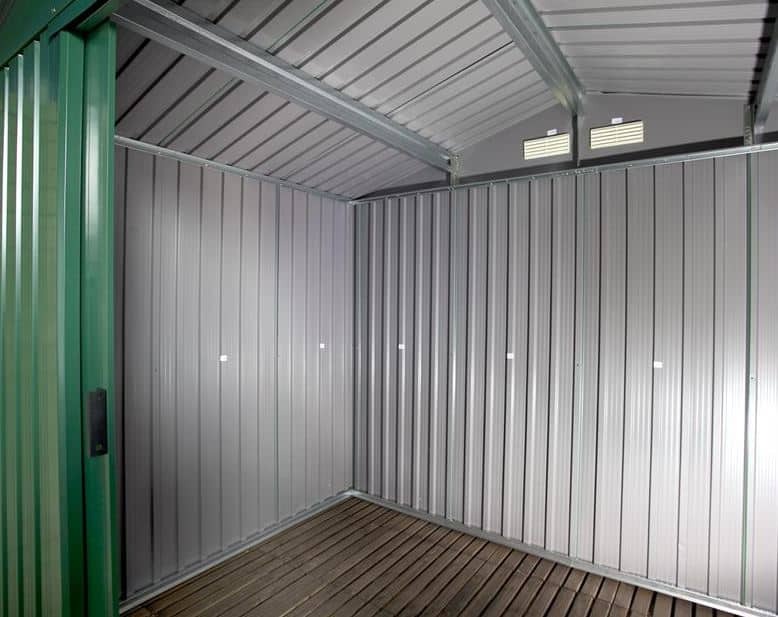 The Billyoh is a premium galvanised steel shed with the strength and durability to protect your items inside from the elements. 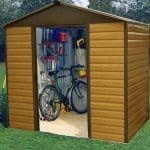 Fire resistant, weather resistant and rustproof, this sturdy shed will be standing in your garden for many years to come. 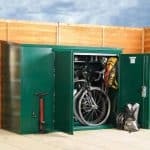 Standing at 8x6ft you will be able to store a reasonable amount of your equipment and at this great price the Billyoh Beeston is a fantastic all-rounder in terms of having it all.